Illustrating Alice: An International Selection of Illustrated Editions of Lewis Carroll’s Alice’s Adventures in Wonderland and Through the Looking Glass. Published by Artists’ Choice Editions, 2013. Since 1907, when the copyright for Lewis Carroll’s Alice in Wonderland expired, there has been a world wide explosion of illustrated editions by artists who have been inspired to visualise Alice in their own fashion. There are at least three hundred illustrated English language editions and eighty from Japan. Carroll’s life and writings have been exhaustively documented but, curiously, very little has been written about the illustrated editions. The focus of Illustrating Alice is, in particular, the contemporary versions and these are discussed by experts and illustrators from nine countries. 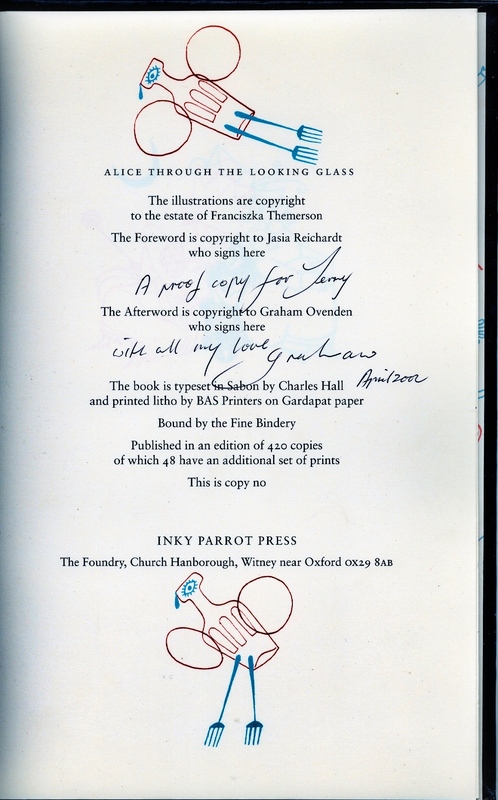 The book has a Foreword by Marina Vaizey, followed by illustrations and commentaries on the interpretation of Alice in different countries. Writers include Adriana Peliano – Brazil; Richard Newnhan – China; Selwyn Goodacre and Dennis Hall – England; Michèle Noret – France; Caterina Morelli – Italy; Prof. Mikiko Chimori – Japan; Prof. Monika Adamczyk-Garbowska – Poland; Ella Parry-Davies – Russia; Mark Burstein – United States and Canada. 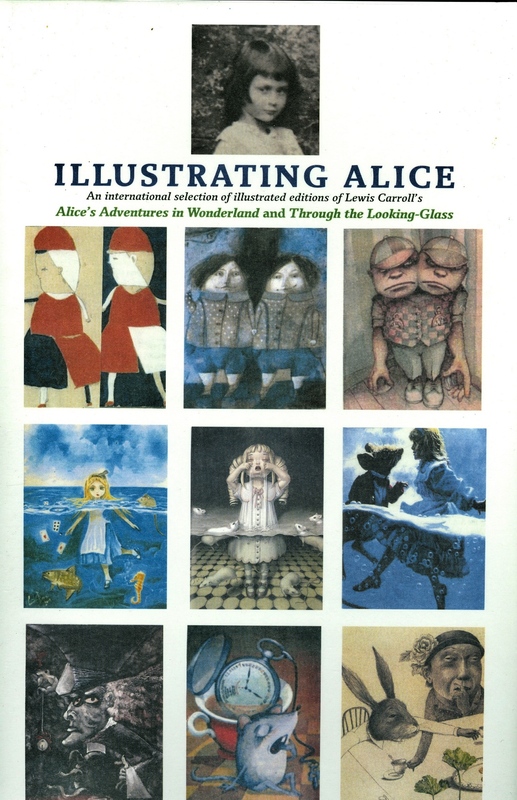 This is followed by reﬂections by artists who have illustrated Alice, with contributions by Barry Moser, De Loss McGraw and Gavin O’Keefe from the US; Ralph Steadman, John Vernon Lord, Helen Oxenbury, Emma Chichester Clark, Justin Todd, John Bradley and Michael Foreman from England; Chiara Carrer from Italy and Tatiana Ianovskaia from Russia. 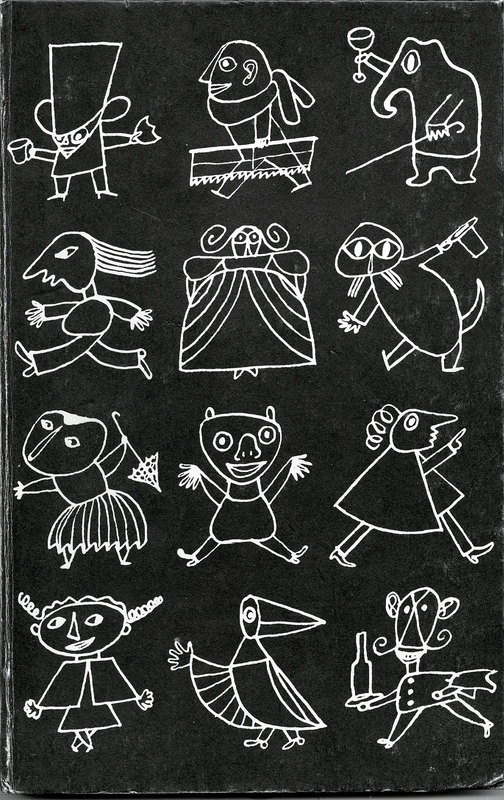 There is a chapter on Alice in ﬁlm in which the Czech ﬁlmmaker Jan Švankmajer discusses his Alice ﬁlm and Karen Lury, Prof. of Film and Television Studies, writes on Animating Alice: the heroine without a heart. Graham Ovenden writes an Afterword. An alphabetical checklist of all English language editions, compiled by Selwyn Goodacre and Edward Wakeling, is included. This is an extremely dangerous thing for me to have bought- it opens a whole new world of books I have yet to buy, but it’s nice seeing old friends in there as well. There are loads of fantastic pictures, and articles by various illustrators (Barry Moser, Ralph Steadman, Helen Oxenbury, Jan Svankmajer). It’s printed on beautiful paper and really is a joy to handle. Available on Amazon in both standard and special editions. From the production at the Noel Coward theatre, May 2013. 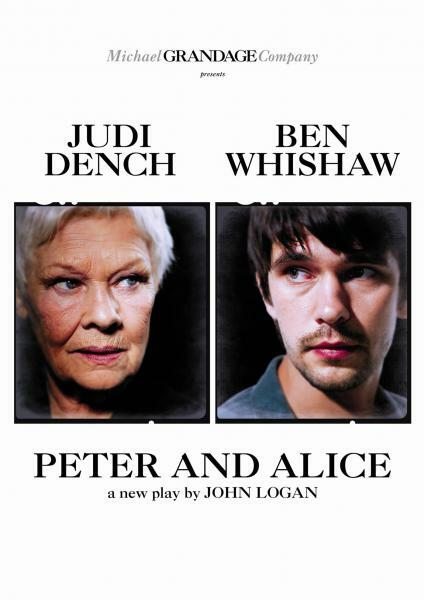 Judi Dench plays Alice Liddell and Ben Whishaw Peter Llewelyn Davis (Peter Pan). The two meet behind the scenes in a bookshop: their encounter actually took place in 1932, when Alice was 80 and Peter 35. The Skyfall writer John Logan has imagined what might have been discussed between them…. The fictional Alice and Peter also appear on stage with the two now adult models for the characters, and prod them into recollections joyful and painful. Consists of two sealed packs of square double-sided cards in a rather splendid tin. You can see it unpacked, and hear it explained, here. Who will you invite to tea? The tea is brewing and the table is set. Everything is ready for tea. But are you still in the real world, or have you passed through the looking glass? Take turns to choose one, two or three Character cards and invite them to tea. Watch out: the two worlds cannot co-exist because opposite profiles cancel each other out. Keep your feet firmly on the ground. The winner is not the one with the most guests, but the one who chooses them wisely! 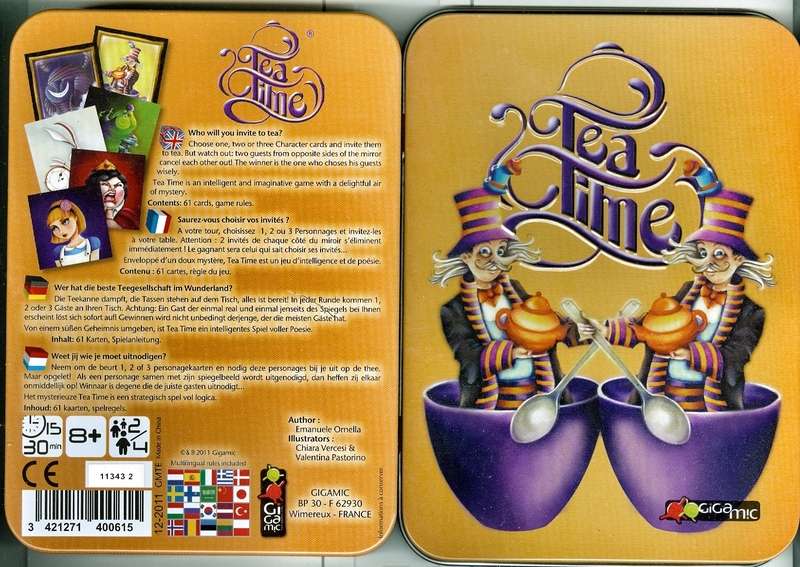 Tea Time is a logical and imaginative game with a delightful air of mystery. Bought for me by my generous ex-boyfriend, but we are yet to have a game… I’m not sure if I want to unwrap the cards!